Black Interceptor Barrage is overflowing with value. Endurance is always nice, and dealing 5 stages and 5 Life Cards for 2 stages is extremely efficient. Most importantly, it allows you to selectively banish cards from an opponent’s discard pile. 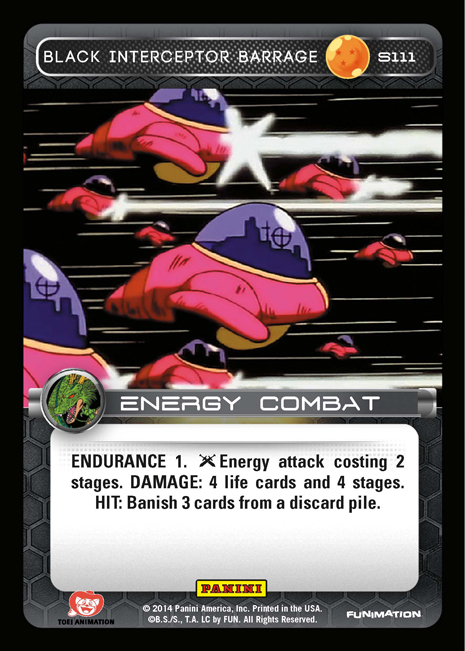 It may be tempting to rely on Black Devious Mastery for its banish effect, but the format continues to reward decks that are able to disrupt cards like Saiyan Drive By, Captain Ginyu – Energized, Heroic Assistance, and Visiting the Past. When working within the confines of a 60 card deck, it is always difficult to find the perfect balance of attacks. Giving up damage output in exchange for utility is a subjective choice, but Black Interceptor Barrage provides a nice middle ground. I hope you’ll consider it! Z Warrior Mailbag – dbztcg.com is Live!